Whoops! Maybe you were looking for Reich? 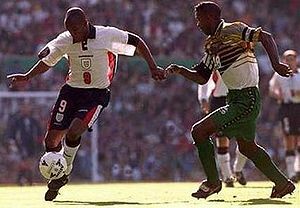 Using his left foot to leave the defender wrong footed and right behind him, Ian Wright shows them that the writing on the wall. Right and left describe the two different sections created when there is a division made by a vertical line. To visualize this concept we must see that any object has a left and a right half. For example, if an orange was cut in half, one half would be the left side, and the other half would be the right side. We could also visualize this using a red balloon. Sadly, if a red balloon were to be cut in half around the center, the balloon would pop. To make things more complicated, left and right are opposite in Europe to what they are in North America. This is because America is on the opposite side of the world. They drive on the opposite side of the road, write backwards, and generally try to make things more difficult. The division happens over the Atlantic Ocean, so there is actually an area where left and right are the same thing. This explains the origin of the "Left left left right left" march. In space there is no left and right, which is why there is no gravity. Right and Left have special meanings in politics. Stinky liberal hippies are known as leftists, while ignorant old conservatives are considered rightists. To make things EVEN more complicated, the leftists think they are right, but they are not, otherwise why would they then be called left.Even worse the wrongest poeple are on the right side, yeah that right they are wrongest. A quick look in a fake dictionary tells us that there is more than one meaning of the word left. When someone goes left as far as state of mind goes, it means that they are getting progressively more like corn in their thinking. If your bet goes left, it means that your financial situation has gotten smaller, but not worse (as opposed to going South). Can you make left from right, forward, and west? That's what alchemists believe. "Left" is only left because you perceive it as such. You cannot know that it is absolutely left, and you must ultimately identify left by examples, not by absolutes. There's no definition for the word "Right". It's always the opposite to "left", no matter what context it is used on, with the sole exception being the engrish usage, when right has another meaning. This also explains why so many girls are left behind while waiting for Mr Right to show up. "No, actually we were right behind". The following chart shows right and leftness by country for every country. If a country is not in the chart, it is because you only imagine it exists (for example, Scotland). Several other places, like Space and France, are also listed. United States of America Left Huh...? Brazil Esquerrrda, uái! Dirêta, mermão! Many ancient priests from the hidden temples of Bogroll inscribed information on the magical properties of left on gargantuan pieces of rock that stretched from the earth to the sky. Many have considered left to be way of life and believe it to be a sacrosanct and holy thing. Some even go so far as to say that "left is the way forward". This is of course highly obvious and correct, since if one rotates left four times, one would be facing the same direction as before, and could hence, continue their journey of enlightenment by proceeding forth. Two wrongs don't make a right, however three rights make a left. Also, two Wrights make a plane. Learn the above. That's right, all of it. Learn it now. I meant the bit about the stuff... yes, that bit. This page was last edited on 16 October 2012, at 23:48.